What do you want from Grave Digger? Do you want their typical Power/Heavy (True?) made in Germany? You get it again in "Ballads of a Hangman", just take the boost Hell of Disillusion as typical German signature in this genre. Do you want Old School ? You get it with songs like Stormrider. Do you want good ballads? The halfballad "lonely the innocence dies", sung in duet with guest Veronica Freeman (Benedictum) can project you in an intense emotion, improving your attention. Do you want an aggressive monumental sound and a good production? You get it in each song. "Ballads of a Hangman" can rely on twin guitars and is the first GD album featuring guitarist Thilo Hermann Do you want any good appealing earworm, anything well composed and memorable? The last song, Pray, is born for acting as such. Great song that makes remind of the big Unrest. Do you want a touch of darkness and pagan? Here you are promptly served already in the very beginning with the opener The Gallows Pole and the second track Ballad of a Hangman. The Gallows Pole is one of the fastest tracks , that , as opener, has the task to demonstrate what a band is able to do. 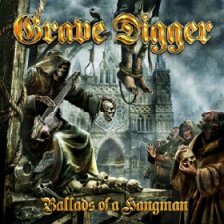 With this song we can truly speak about Power Metal, while in Ballad of a Hangman, which is actually no complete ballade but a true lively, cadenced anthem , the protagonist is a solid Heavy Metal galore. Both songs are spiced up with the addition of a drop of pagan mood. But again to Lonely the innocence dies, which, without a doubt, is the big attractor. It's dark, so dark for a genre like this. The duet contemplates 2 very aggressive and unmistakable voices, which seem to be in contrast, but in reality they both rip off with the same raspy solidity, and fully integrate. For the rest, Chris Boltentahl gritty and throaty vocals are totally ok for me, who generally dislike high-pitched timbres. Personally i find that this album, that moreover might have concept features, is better than "Liberty or Death", here and there it sounds fresh, surely due to the new graft in the line up. And again i would underline the presence of that "Lonely the Innocence dies" which seem to come from totally other shores, and of course the last impression left by the excellent Pray. only a couple of songs seem composed without much inspiration following a predictable plot. All in all this album is a good, a force-driven work, a strong one, which will be a companion for all fans of the band and for all who like German Heavy `n Power with hoarse vocals, hammering riffs, and fit soli . In few words, legendary and veteran Grave Digger is amply confirmed and doesn't disappoint. Finally, the cover art in totally Grave Digger style. This time we have death along with skulls, fog, monks, late medieval "flair", gothic cathedral, gallows and ravens. A cover art that seems more oriented towards elements like air and earth instead than water/fire.